The Speedy boasts advanced engineering, rapid acquisition of data, and the medical retro illumination mode. It’s large, high quality monitor allows for easy alignment and focusing.fast Readings are taken the instant that alignment and focus is achieved, and terminated when accurate data is gathered. Measurements are taken at rapid speed, making the instrument perfect for fast measurement acquisition. Refraction and keratometry measurement can be taken in 0.35 seconds. 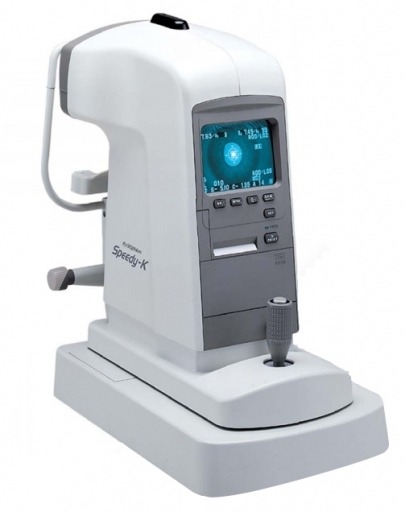 Cataract Detection function: When the patient has a cataract or any other opacity, a 3-mm ø red ring appears on the monitor during refraction, showing the opacity of cataract by percentage. Auto Quick function: When refraction data is difficult to obtain, (patient unable to fixate etc), the Auto Quick function is automatically initiated to continuously capture readings. Allows auto refraction even on the most difficult of patients. Acccommodation Measurement Function: Measure the difference between target distance presentation and ocular accommodative response with the Accommodation Modulation function. Help identify sources of asthenopia and quantify accommodative response. Auto Retro Function: Identify size and location of opacities with the Retro illumination function. The image is then binarized, rendering the opacity image clear and printouts readily identify location and size of opacity. Click the button below to add the Right Medical Speedy K Autorefractor Keratometer to your wish list.